What is the sub of choice with professional DJs? JBL? Mackie? EV? The answer: Tuba. Why are Tubas rated higher than even the most expensive commercial brands? Because they work. Take the Tuba 30, for instance. This SPL chart compares a single 30x30x27 inch 70 pound Tuba 30 loaded with an Eminence Delta 12 LF driver to the Cerwin-Vega L36, which is 30% larger and weighs twice as much. I built two full size T30's using JBL 2206 drivers. The sound from these cabs is nothing short of STUNNING! The bass has real authority and is fast and dynamic! 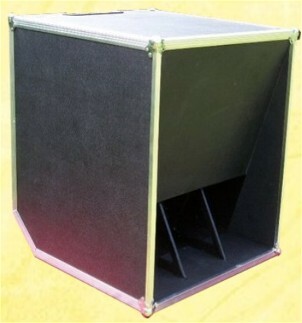 Overall, the cabs have a way of reproducing bass in a very effortless manner, even with with heavy DJ/ dance material. Such a change from that 'struggling woofer' sound you get from typical 2x15 cabs. The waveform of the bass is 'tactile' if thats the right word. You can almost sense the momentum the wave builds up while travelling the length of the horn. Like a friggin e xpress train when it emerges! Yes I am waxing a bit lyrical here, but the satisfaction of firing these up was unique treat! Construction was relatively easy for me using very limited tools. I built the second much faster than the first, and used a handheld circular saw for the internal cuts, the rest being cut to size by the timber guys. The sheer presence and authority of these cabs outweighs any hauling gripes. Big thanks to Bill and the excellent Forum resource! Build options abound with the T30. 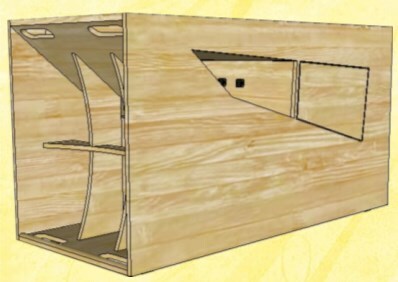 They may be built from 16 to 30 inches wide, loaded with one or two ten or twelve inch drivers. Build costs start from about $180 for a 16 incher loaded with an Eminence BP102. The T45 is an oblong version of the T30. It uses the same drivers and has similar response to the T30, but its side profile measures 24 by 45 inches. Loaded with a ten inch driver it may be built as narrow as 13 inches, loaded with a twelve as narrow as 15 inches. The design is ‘end firing’, just like the T60, so it may placed laid down, or stood up on end where floor space is tight. Wider cabs and dual driver cabs will handle larger audiences. Equivalent Retail Value: $899 to $2999, depending on cabinet size and driver complement. The T30 and T45 are separate plans. You must specify which plan you want when ordering. Plans are $14.95, delivered within 24 hours as email attachment in MS Word format. 23 Pages, 30 Diagrams. PDF available on request.